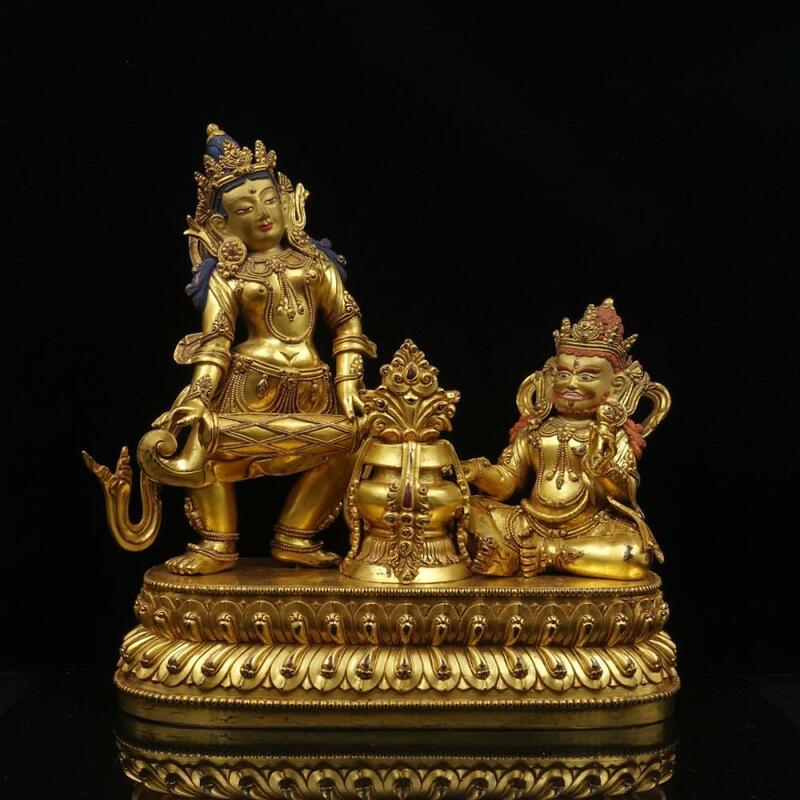 A collection of items from different estates and collections, including jades, porcelains, statues, and more. All property offered and sold through Bernards Auction Gallery Inc. shall be offered and sold on the terms and conditions set forth below. By bidding at the auction, whether present in person or by agent, by written bid, telephone, internet or other means, the buyer agrees to be bound by these terms and conditions. All properties are sold "AS IS". All sales are final. No returns. All purchases (including buyer's premium) will be subject to a New York State sales tax of 8.75% unless (1) the buyer is an out of state resident and merchandises are being shipped out of New York or (2) the purchaser has a valid tax - exempt certificate (an actual resale certificate) must be presented and on file with Bernards Auction Gallery Inc.
All properties are sold "AS IS" and all sales are final. We do our best to describe the item's material, age and conditions. Written and oral descriptions are our opinions and should in no way be interpreted as a fact nor a guarantee of any kind such as, authenticity, age, condition and materials. Prospective buyers are strongly advised to examine personally any properties in which they are interested in before the auction to determine its condition, size, and whether or not it has been repaired or restored. Shipping and insurance is the responsibility of the purchaser. Purchase is not contingent upon shipping costs. Please explore the costs before you bid. All property purchased from Bernards Auction Gallery Inc. must be paid within 15 days after the auction. All property purchased from Bernards Auction Gallery Inc. must be removed within 30 days after the auction date. Bernards Auction Gallery Inc. will not be responsible for paid items left for over 30 days after the auction date (unless a prior agreement has been made.) Items left after 30 days will incur a $10/day storage fee per item. Once storage fees have exceeded the actual purchase price of the item(s) Bernards Auction Gallery Inc. can exercise the right to repossess the item and re-auction. The rights and obligations of the parties with respect to these Conditions of Sale and terms of guarantee, as well as the purchaser's and our respective rights and obligations hereunder, the conduct of the auction and any matters connected with any of the foregoing, shall be governed and interpreted by the laws of the State of New York. By bidding at auction, whether present in person or by agent, by written bid, telephone or other means, the buyer shall be deemed to have submitted, for the benefit of Bernards Auction Gallery Inc., to the exclusive jurisdiction of the federal or state courts located in the state and county of New York and waives any objection to the jurisdiction and venue of any such court. By bidding at auction, whether present in person or by agent, by written bid, telephone, internet bid or other means, Bernards Auction Gallery Inc. will keep the bidder's contact information for future auction or news event notifications, unless bidder specifically notify our auction house to remove their name from such list. All bidders (floor, phone, absentee, and internet) require submitting a credit card information as a security measure in order to participate in auctions held by Bernards Auction Gallery Inc.. We reserve the right to request for a security deposit before approving the bidder. Bernards Auction Gallery Inc. reserves the right, at our complete discretion, to refuse admission to the premises or participation in any auction and to reject any bid, as well as the right to refuse to acknowledge any bidder. The highest bidder acknowledged by the auctioneer will be the purchaser. The auctioneer has the right at his absolute and sole discretion to advance the bidding in such a manner as he may decide, to withdraw or divide any lot, and to combine any two or more lots. In the event of error or dispute between bidders, or in the event of doubt on our part as to the validity of any bid, whether during or after the sale, the auctioneer has final discretion to determine the successful bidder, to continue the bidding, to cancel the sale, or to reoffer and resell the lot in dispute. If any dispute arises after the sale, the Bernards Auction Gallery Inc. sale record shall be conclusive. In addition to the other remedies available to us by law, we reserve the right to impose a late charge of 1 1/2% per month of the total purchase price if payment is not made in accordance with the conditions set forth herein. Bernards Auction Gallery Inc. shall have no liability for any damage to property left on its premises for more than (7) days following the sale. In addition, a defaulting purchaser will be deemed to have granted and assigned to us a continuing security interest of first priority in, and we may retain as collateral security for such purchaser's obligations to us, any property or money of or owing to such purchaser in our possession. We shall have all of the rights accorded a secured party under the New York Uniform Commercial Code with respect to such property and we may apply against such obligations all monies held or received by us for the account of, or due from us, to such purchaser. At our option, payment will not be deemed to have been made in full until we have collected funds represented by checks, or in the case of bank or cashier's checks, we have confirmed their authenticity. In the event the purchaser fails to pay any or all of the total purchase price for any lot and Bernards Auction Gallery Inc. nonetheless elects to pay the consignor any portion of the sale proceeds, the purchaser acknowledges that Bernards Auction Gallery Inc. shall have all of the rights of the consignor to pursue the purchaser for any amounts paid to the consignor, whether at law, in equity, or under these Conditions of Sale. •	We do not accept credit card with payments over $2,000. Buyers must contact Bernards Auction Gallery Inc. for shipping options. A shipping release form is also required to be filled out and sign in order for us to release the item to the shipping company. If you decide to use your own methods or another shipper that's not on our suggested list of shippers, you must inform us prior so that there will be no confusion! Description: Qing Dynasty. Dimension: 3.1 x 1.2 inches, 8 x 3 cm. Description: Qing Dynasty. Dimension: 2.8 x 1.6 inches - 2.2 x 2 inches, 7 x 4 - 5.5 x 5.2 cm. Description: Qing Dynasty. Dimension: 3.3 x 1.8 inches, 8.5 x 4.5 cm. Description: Qing Dynasty. Dimension: 3.5 x 2.8 inches, 9 x 7 cm. Description: Qing Dynasty. Dimension: 2.4 x 1.4 inches - 3 x 1.6 inches, 6 x 3.5 - 7.5 x 4 cm. Description: Qing Dynasty. Dimension: 1.4 x 2 inches - 2.4 x 1.6 inches, 3.5 x 5 - 6 x 4 cm. Description: Qing Dynasty. Dimension: 3.3 inches, 8.5 cm. Description: Qing Dynasty. Dimension: 3 inches, 7.5 cm. Description: Republic Period. Dimension: 2.1 - 3 inches, 5.3 - 7.5 cm. Description: Qing Dynasty. Dimension: 3.7 x 2.6 inches, 9.5 x 6.5 cm. Description: Qing Dynasty. Dimension: 2.4 - 2.6 inches, 6 - 6.5 cm. Description: Republic Period. Dimension: 2.7 - 3.5inches, 6.8 - 9 cm. Description: Dimension: 5.1 inches, 13 cm. Description: Republic Period. Dimension: 10.2 x 5.1 inches, 26 x 13 cm. Description: Qing Dynasty. Dimension: 3.9 x 2.6 inches, 10 x 6.5 cm. Description: Republic Period. Dimension: 3.5 inches - 3.9 inches, 9 - 10 cm. Description: Republic Period. Dimension: 2.8 - 3.9 inches x 1.8 inches, 7 - 10 x 4.5 cm. Description: Qing Dynasty. Dimension: 3.1 - 5.1 inches x 2.8 inches, 8 - 13 x 7 cm. Description: Qing Dynasty. Dimension: 3.5 x 2 inches, 9 x 5 cm. Description: Qing Dynasty. Dimension: 2.8 x 2.4 inches, 7 x 6 cm.